Reading blogs has become my new hobby. Well, it's nothing new. I've been a faithful blog reader for quite some time. But have recently become obsessed with reading blogs. There is just so much great info out there that others are willing to share. 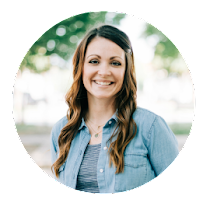 Every time I cook something new, come up with a new organizational tool or a new peice of home decor, my family asks me if I found it on a blog. These photo cubes are so cute! They are just printed and folded paper. So smart! Go check them out here. Look at these mirrors. They look straight out of the Ballard Catalog. Go check out how Alicia made these. You'll never believe how she did it! As if the mirrors weren't amazing enough, she made this desk too. Out of a DRESSER!!! I know right? Can you believe it? So talented! 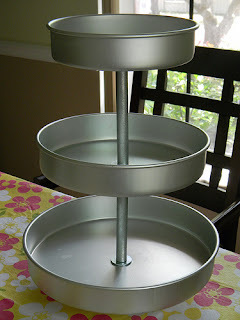 This cute galvanized tiered stand looks just like the one from the PB catalog. She made it with cake pans. I know I just reworked my craft room, but after seeing this one, I have new plans. And you MUST go check out the kitchen on this blog. Amazing! Makes me want to redo my kitchen tomorrow.